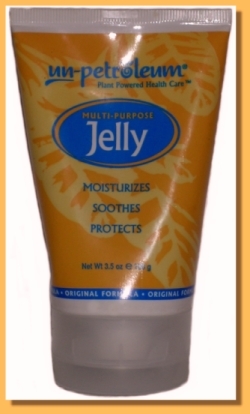 Un-Petroleum Jelly is a multi-purpose skin moisturizer and protectant made from natural plant oils and waxes. -- Helps to protect against diaper rash. Removes make-up, such as little kiss marks all over baby's tummy. Also great for those with gluten intolerance. Ingredients: Castor Oil, Coconut Oil, Beeswax, Castorwax, Soybean Oil, Tocopheryl Acetate and Tocopherol (Vitamin E).